“The Poet’s Cottage” sits on the western shore of West Grand Traverse Bay, a gem of Northern Michigan! From this vantage point breathtaking sunrises appear over the tip of Old Mission Peninsula 2 miles across the bay as you are located on the 45th parallel. Coffee or tea on your deck greeted by the morning sun and million dollar view brings a smile ear to ear and is your reward for working hard all year! It just doesn’t get any better than this – you’ve found your place in our Northern Michigan Paradise! At night you see the Northern Lights and the vague lights on the shore from Grand Traverse Light to Charlevoix to Petoskey! The stars in the sky are truly north to south on the horizon. 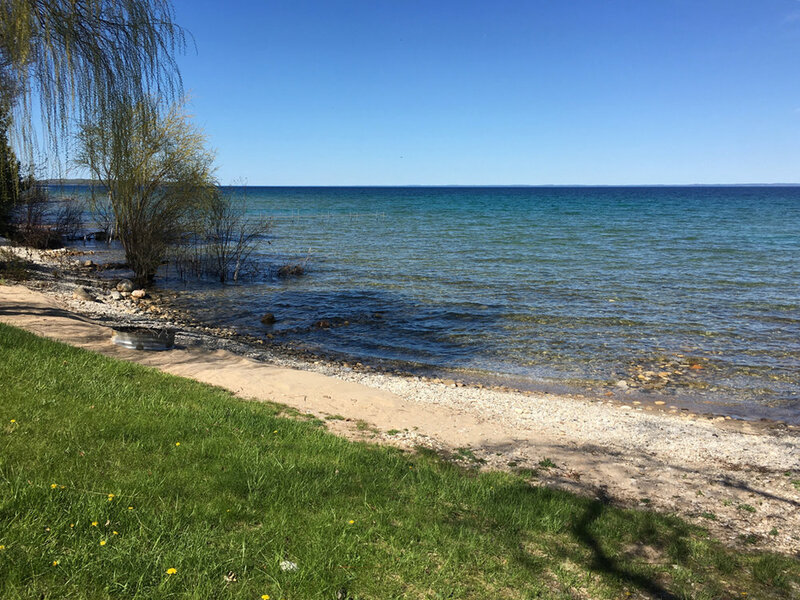 This wonderful cottage is located 3 miles east of the quaint Village of Suttons Bay on the Stony Point peninsula, a highly desirable neighborhood that is quiet, safe and rural in character. The area is perfect for your daily walk or bicycling the paved roads. The cottage was extensively remodeled in 2015. This cottage is 1.200 square feet with a totally remodeled kitchen consisting of white cabinetry and quartz countertops and random width wood floors throughout. The interior has been totally repainted and the front enclosed porch overlooking West Grand Traverse Bay has also been remodeled. Two bedrooms and two full baths equipped with 2 queen beds and a bunk bed, sleeps a total of six. The 2nd bath was a new addition in 2017! There is also a charcoal grill, washer / dryer, and dock available for your use. Wi-Fi, cable and a flat screen TV are also included. NOW BOOKING REMAINING 2019 DATES! Off Season : $329 per night, 4 night min.